The US Senate has confirmed President Trump's Supreme Court nominee, after a bitter, 14-month battle for control of the highest court in the land. 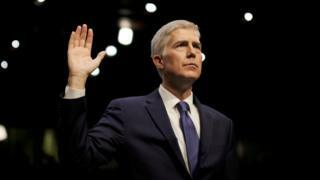 The chamber voted 54-45 on Friday to seal the confirmation of Denver appeals court judge Neil Gorsuch. Republicans took the historic step this week of changing the chamber's rules in order to ram through their pick. At stake is the final legal say on everything from gun control to abortion to election finance to workers' rights. Mr Gorsuch, 49, was confirmed within 65 days of his nomination, but the battle to appoint another justice to the judicial bench began with the death of Justice Antonin Scalia, a conservative darling, in February last year. Though Mr Gorsuch proved evasive when questioned on legal matters during his confirmation hearings, he has a solidly conservative pedigree and is expected to rule accordingly. Republicans hope Mr Gorsuch will hand the bench's bloc of conservative justices a winning 5-4 majority. "He's going to make an incredible addition to the court," Senate Majority Leader Mitch McConnell said. But Senate Democratic leader Chuck Schumer, who led the anti-Gorsuch opposition, said the court was "increasingly drifting towards becoming a more pro-corporate court that favours employers, corporations and special interests over working America". 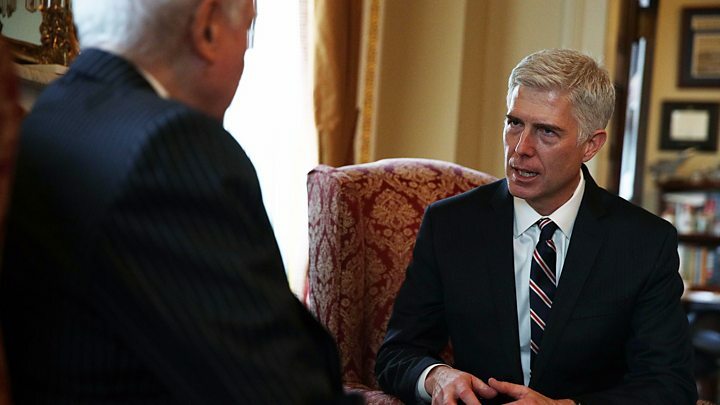 On Thursday, Mr McConnell triggered a legislative manoeuvre known as the "nuclear option" when Republicans lacked the 60 votes required to end debate on Mr Gorsuch. The chamber's majority leader tore up the rulebook after Democrats mounted the first filibuster of such a nominee in half a century. The result is a triumph for Donald Trump's young presidency. For many of those who voted for him, getting a conservative judge on to America's highest court was a top priority. "Congratulations to an exceptionally qualified and respected judge," the president tweeted. 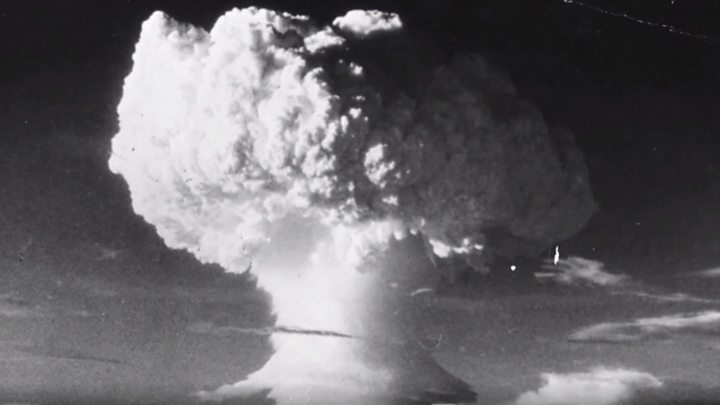 Media captionSupreme Court fight: What's the 'nuclear option'? The vacancy on the nine-judge bench had left the justices to pass over many controversial issues, possibly to avoid a 4-4 stalemate. The Democrats were left fuming last year when Republicans refused to consider former President Barack Obama's nominee to the court. Democrats used the "nuclear option" in 2013 to overturn Republican filibusters against executive branch and judicial nominees for lower courts. But they left the filibuster in place for Supreme Court nominees. Mr Gorsuch may be sworn in as early as Friday so he can start getting ready for the court's next session of oral arguments this month.